The Chinese Communist Party (CCP) doesn’t acknowledge the existence of the Tuidang Movement—the grass-roots movement born in 2004 that helps Chinese quit the Communist Party and its affiliated organizations. Yet China’s security apparatus will take away those who distribute or possess Tuidang material, or even talk about it to others. The authorities will usually confiscate the “quitting the CCP” material from the mainland Tuidang volunteers and sentence them to lengthy jail terms. A sampling of cases follows. *On Oct. 19, 2012, Wang Ruizhi from Jiuquan city, Gansu Province was sentenced to eight and a half years in prison for handling out the “Nine Commentaries” and other materials. *On Nov. 22, 2013, Huang Ji from Liuzhou City, Guangxi Province was given a four-year jail term for downloading the “Nine Commentaries” off the Web, copying it to DVDS, and passing them out in public. *On March 12, 2014, Lv Yinxia was sentenced to four years in prison for distributing the “Nine Commentaries” and other Tuidang material. 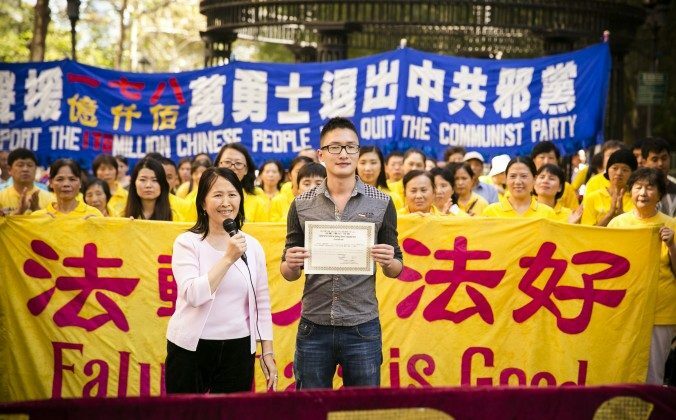 Because most Tuidang volunteers in China are Falun Gong practitioners, they face other perils once in prison—including brainwashing, physical or mental torture, forced labor, and the harvesting of their organs. Falun Gong is an ancient spiritual discipline that teaches the principles of truthfulness, compassion and tolerance. It has been persecuted by the communist regime since 1999.